Why Wait for Hot Water? I recently installed a hot water recirculating system at my home. I did this to save water and time. There are a couple different types of these systems available but I will focus on the one that I used. 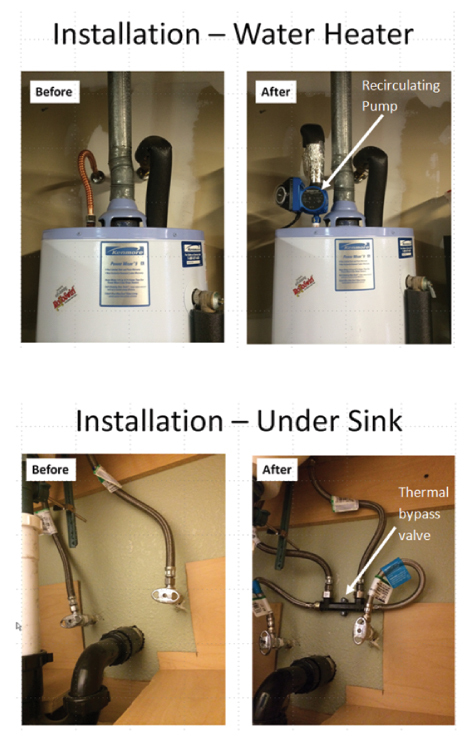 Here’s how it works: A small pump is installed on top of the water heater and a thermal bypass valve is installed under the sink that’s furthest from the water heater. That’s it! The average household wastes thousands of gallons of water per year waiting for hot water. It used to take about 2 minutes and 15 seconds before my shower was hot enough to get in, now it takes 25 seconds. This is an 80% reduction in time and water (about 3 gallons per shower based on my 1.8 GPM showerhead). I experienced similar savings at the bathroom faucet. Between the shower and faucet I calculated an annual water savings of about 2,000 gallons for two adults. I will personally save over 10 hours per year not waiting for hot water—maybe I’ll use that time to think of other ways I can save water! Your energy use will go up slightly because you’re heating the same water twice. These recirculating systems move hot water in the pipes (that has already been heated once) back to the water heater to be heated again. If you don’t want to increase your energy usage and you’re willing to wait for hot water, you can forgo the recirculating system and “shower with a bucket.” The water you capture in the bucket can be used to flush toilets or water plants. Most of these pumps have a timer that you set for certain times of the day (when you’re most likely to shower, wash your face, etc.). If you do these activities when the pump is off then you’ll have to wait for hot water (just like you used to). Most of these systems use your cold water pipes as a return line back to the water heater. This means that when the pump is running you’ll get several seconds of warm water when you turn on the cold handle. This also means that you are putting water that has passed through the water heater into your cold pipes. Some research has shown that you shouldn’t drink water that has passed through the water heater because it can contain higher concentrations of lead. I filter my drinking water so I’m not too concerned about this. To maximize efficiency you should consider insulating all of your hot water pipes. Some recirculating systems won’t work with tankless water heaters. So keep this in mind if you have, or plan on installing, a tankless water heater. For detailed research about recirculating systems, check out this helpful webpage from the Alliance for Water Efficiency. Please turn off your irrigation system for the season. If dry weather continues, check newly planted, container and high-water-use plants for stress and water if needed. Note that, even without rain, most plants require little water this time of year. I would like to add a personal touch to this statement. My backyard has a small, 500-square-foot patch of 90/10 tall fescue. We get a lot of use out of this lawn: I have a black lab that loves to play fetch, and my 14-month-old toddler is quickly learning that it’s less painful to fall on grass than on the patio. 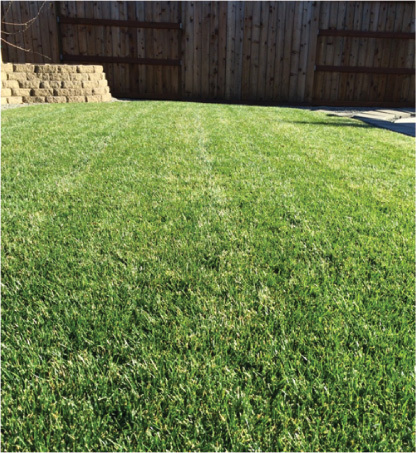 Even though grass is among the highest water-use plants, usually our rains provide all the winter irrigation a lawn needs. This year, though, I started to get concerned when one dry day followed the next. However, as a water conservation specialist, my training and experience told me it’s not that low rainfall equals thirsty plants but that low evapotranspiration (ET) equals plants that aren’t very thirsty. ET is the loss of water to the atmosphere by the combined processes of evaporation (from soil and plant surfaces) and transpiration (from plant tissues). It is a good indicator of how much water your lawn, garden, and trees need to stay healthy—and in winter it tends to be pretty low. Even with almost no irrigation this winter, Craig’s lawn is still healthy and happy. According to 2013 data from the Marin weather stations—and despite less than two inches of rain during December—plants needed about 80 percent less irrigation in December than during the average summer month. This information allowed me to comfortably decide to water my lawn only one day in the month of December. I also have several other plants (lavender, rosemary, heavenly bamboo, breath of heaven, lantana, various grasses, etc.) that received zero irrigation in the month of December, all of which are doing just fine. I also have rosemary in a pot on my front porch that gets plenty of afternoon sun and starts to brown if I don’t water it one to two days per week in the summer; however, it was completely happy with only one watering in December. My brother used a few sprigs of this plant to prepare his famous garlic rosemary mashed potatoes that received lots of positive attention during our Christmas dinner. Different species of plants handle dry and/or freezing conditions differently, so it’s important to learn about your own plants. But my earlier point still stands and is worth repeating: It’s not that low rainfall equals thirsty plants but that low evapotranspiration (ET) equals plants that aren’t very thirsty. Another thing you can do to help manage your landscape water use is to replace your standard irrigation controller with a smart irrigation controller. MMWD is offering rebates for smart controllers, toilets, and clothes washers. Visit the rebate section of our website for more information. 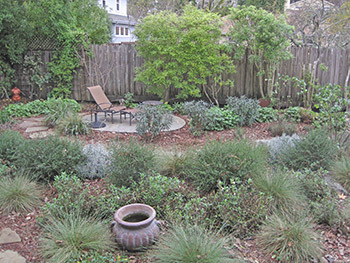 Registration is still open for the 2013 Marin-Friendly Garden Tour, scheduled for Saturday, May 18, from 10 a.m. to 4 p.m. It only takes a minute to sign up using our online registration system, and there’s no charge to attend! Register by May 1 to be automatically entered into a drawing to win a Marin-Friendly prize! We hope you can join us. The 2013 tour features nine inspiring gardens that showcase a variety of environmentally friendly practices, ranging from conserving water to creating wildlife habitat. Here’s a sneak preview of one of the gardens on this year’s tour. There are so many reasons to visit this garden. The front yard has a collection of towering redwoods and an impressive valley oak that have watched the neighborhood mature for over 100 years. When you enter the backyard, it’s hard to believe that for 40 long years the entire space was covered in cement and a swimming pool. This all changed when new owners purchased the home in 2010. They worked with a landscape professional and designed the backyard to be drought-tolerant and wildlife-friendly, with mostly native plantings, and a vegetable and herb garden. Stepping-stone pathways connect three small patios, and artwork is peppered into the landscape to add color and character. One corner of the backyard features two raised beds for a seasonal vegetable garden and a wire trellis on the fence encouraging two young kiwi plans to grow. Soil is kept healthy through the use of a compost bin. An onsite well is used for irrigation, and the owners carefully manage their water by using drip irrigation and a self-adjusting irrigation controller. For more information about the 2013 Marin-Friendly Garden Tour visit marinwater.org. What do leaks sound like? Most of us have heard a toilet running or a broken pipe gushing, but fewer of us have heard the subtle hissing of water pushing through a stuck irrigation valve. Automatic irrigation valves (also called solenoid valves or electric valves) are usually located somewhere along the perimeter of your house, apartment or business and are often grouped together, forming something called a manifold. These manifolds are sometimes located in valve boxes that may be buried and covered in mulch or soil. Because of their inconspicuous locations, people often overlook them when searching for leaks. The main reason an irrigation valve develops a leak is because something gets stuck in it. If sand, sediment, glue residue or even an insect gets caught in your valve, it can keep it from closing. And if the valve doesn’t close all the way, then you will be losing water 24/7 until it is repaired or replaced. Even though the valve is the source of the leak, the escaping water continues through the pipes and will usually emerge from your lowest sprinkler heads or drippers. So a soggy spot on one part of your property might be caused by a stuck valve somewhere else. As an MMWD Water Conservation Specialist, I’ve identified several irrigation valve leaks while performing water-use efficiency surveys for customers through our Conservation Assistance Program. I recently found a 370-gallon-per-day leak (based on meter movement) that was being caused by two stuck irrigation valves. This particular home is on a slope so the water was draining to the bottom of the property—out of sight, out of mind . . . until the water bill arrived. When I put my ear near the valves I could hear the hissing as water squeezed through the stuck valves. So the next time you’re looking or listening for leaks, remember to check your irrigation valves. To help you evaluate your entire property, both inside and out, MMWD has an easy step-by-step guide to help you check for leaks and make sure your house is water efficient. You can find the Do-It-Yourself Home Water Survey on our website, or visit us at 220 Nellen Avenue in Corte Madera to pick up a copy. Prefer to have one of our water conservation experts perform a survey for you? Call us at 945-1523 to schedule a free appointment. Calling all students, teachers, school administrators, parents and volunteers to get the word out about MMWD’s FREE environmental education programs for the 2010-11 school year! Our goal is to instill an appreciation for and understanding of Marin’s unique natural environment in students of all ages. Join us and learn all about one of the most amazing substances on earth—water! Participants will learn about water supply, personal water use, simple water conservation practices, watersheds and watershed ecology, among other things. Through a visit to the Mt. 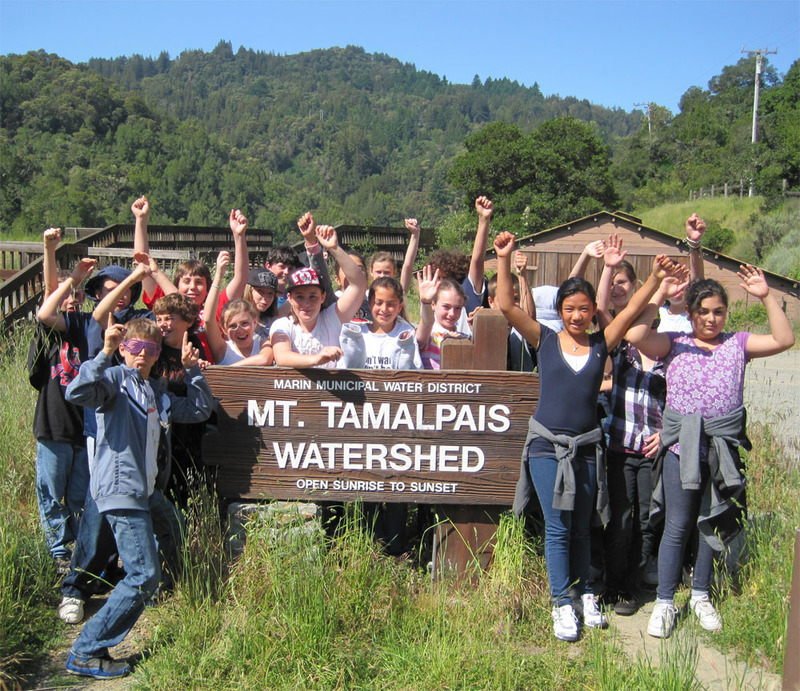 Tamalpais Watershed, students can discover where their water comes from, gain hands-on experience in habitat restoration, and participate in meaningful scientific research in the field of vegetation ecology. All programs are designed to support California education standards while fostering water conservation and environmental stewardship. Hurry! Our programs are offered on a first-come, first-served basis. For complete details and scheduling information, see our school education page. Staying hydrated is one of the easiest ways to maintain good health, but how you choose to do this also can impact the health of the environment and your pocket book. If you drink two liters of bottled water everyday for an entire year it can cost you over $1,000, but if you drink the same amount of MMWD tap water for a year, delivered to your house 24/7, you can spend less than $1. That’s right, bottled water can cost 1,000 percent more than tap water! In addition to the cost, you will end up with hundreds of empty plastic bottles at the end of the year as opposed to just one refillable bottle. It also takes a tremendous amount of energy to manufacture plastic bottles—in fact, it can take 4x more water to make the bottle than to fill it! These are just a few of the water facts we shared with over 100 Tamalpais High School students at the school’s Earth Day Festival. 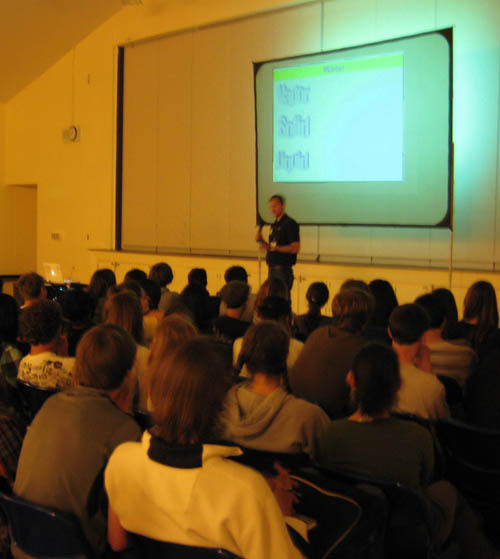 MMWD has been offering similar classroom presentations throughout the 2009-10 school year, and teachers and students have responded with enthusiasm. If you are a teacher and would like to schedule a presentation by one of our water experts before summer vacation, it’s not too late! Just call us at (415) 945-1529. Or, plan ahead for next school year. The classroom visits include topics such as water conservation/supply, everyday water use, our dependence on local rainfall, the water cycle, and more. Presentations also can be tailored to focus on particular topics, or to incorporate take-home water audit kits which students can complete with their families to evaluate their own water use. MMWD recently hosted a three-day Rainwater Harvesting & Accreditation Workshop at the College of Marin’s Indian Valley Campus. While rain was pouring outside, in the classroom 30 interested students learned all about capturing this valuable resource. The students came from various backgrounds and included landscape professionals, plumbers, city and county employees, non-profit employees, and others. 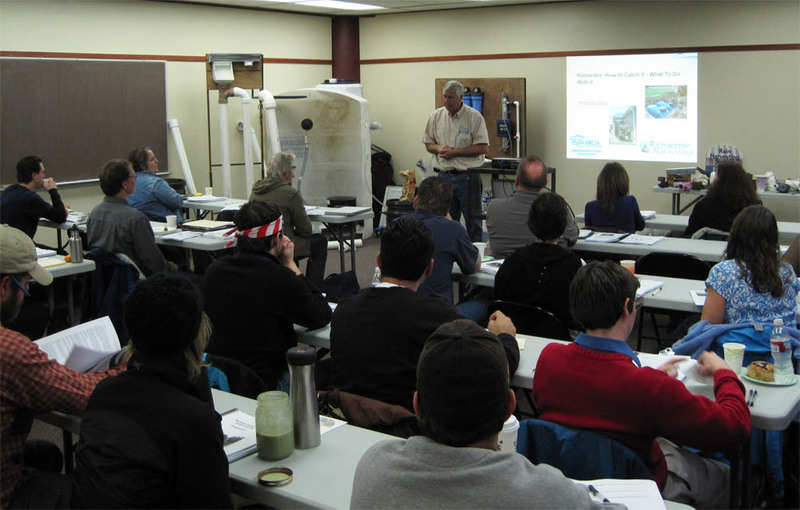 Billy Kniffen, with American Rainwater Catchment Systems Association (ARCSA), used his extensive knowledge and firsthand experience in teaching the workshop. In addition to being an ARCSA instructor, Billy depends 100 percent on rainwater for all of his indoor and outdoor water needs at his home in Menard, Texas. Day one of the workshop (Level 100) introduced rainwater harvesting in non-potable applications, such as landscape irrigation Days two and three (Level 200) dove into this subject and covered design, installation, outdoor and in-home use, sanitation, rules and regulations, and more. To learn more about these workshops and the Association’s upcoming events, visit www.arcsa.org. The workshop was particularly timely as MMWD has recently formed a partnership with the Salmon Protection and Watershed Network (SPAWN) to launch the “10,000 Rain Gardens Project.” This community-based program is designed to provide FREE rainwater harvesting resources (technical, design assistance) to residents and businesses that are MMWD customers. To learn more about this program please visit www.spawnusa.org.